A toy is only useful inasmuch as much as a child is willing to play with it. Professionals who design store layouts and displays study adult psychology and apply their research to make and display their products in an enticing manner. In fact, these professionals believe that if a customer merely touches a product that the customer has a significantly higher rate of buying the item. Displaying toys for children, whether in a home, school or a store, uses many of the same principles. This article will focus on the use of containers for display and ultimately learning! Many of children’s toys come in well organized packages, but once you tear these packages apart, you are often left with several pieces that young children love to scatter about the home. If you have taken my play and learning seminar, you know that children need to be allowed to scatter and use toys where the choose in the home, but at the end of the day, the toys need a home base to return to. Containers make a great home base for toys and help you to keep the pieces from being lost in the Great Abyss (toy boxes… yes I loathe toy boxes!). 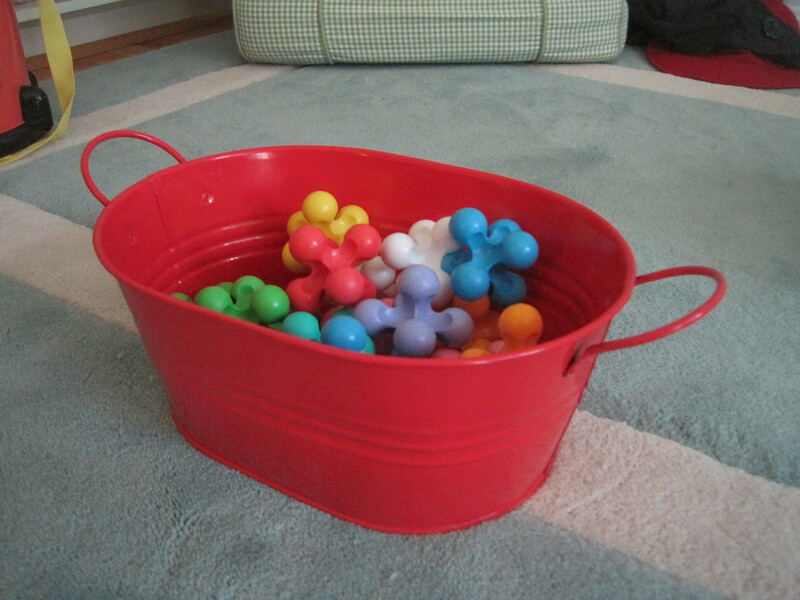 Instead of keeping all your toys and their pieces thrown, dropped, scattered and forgotten in a toy box, where most children don’t have the strength, attention span or memory to retrieve toys to play with, I advise using smaller, individual containers. Any toy that is not self-contained and has pieces that can be scattered and lost, needs a container for storage and display. While storage containers can be static, it is best to occasionally change the display container for toys. Buying new containers can be expensive, but there is no need to spend large sums of money on a new set. Instead, purchase a couple of shallow bins of different shapes, sizes, materials and colors and find other containers found around the home to add to your collection. Shoes boxes, bins, bowls, tubs, pots, tins, paper bags (never use plastic bags), etc… are some of the best places to store toys. Although a uniform container system may meet your need for clarity, beauty and perfection, containers of all shapes and sizes can actually feed your child’s mind. How, you might ask? When children play, children learn. Therefore, more play experiences can equal more learning. Focusing attention on making play things accessible can result in more learning for your child and more sanity for you. A happy baby makes a happy momma! Young children are not born with a clear understanding of physical properties. In fact, their ability to estimate size, shape, weight, volume and mass is not even close to being fully developed yet. You will notice around the age of 4-6 years that children can finally pour milk into a glass and stop pouring before the glass overflows. This seems so obvious to adults, but the ability to stop pouring at the right time is actually quite complex. Child require numerous experiences with mass, amount, volume and density to develop the brains ability to make accurate, subconscious calculations that enable them to stop pouring before a glass is full. Jean Piaget (renown 20th century theorist in the field of child development) defined this type of learning as the theory of conservation or understanding that objects have static properties (number, weight, volume, density) and while an object may change form, it’s properties will stay the same. For example, if you pour 1 cup of milk into a tall, skinny glass and 1 cup of milk into a short, wide glass young children will universally conclude that there are different amounts of milk in each cup. Pouring the milk back into a 1-cup measuring glass in front of them usually doesn’t convince them that the volume of the milk did not change. Young children can only see and understand what is directly before them. Normally developing children will master the theory of conservation and will learn to understand that 1 cup of milk has the same volume, no matter what glass it is poured into, but children acquire this learning at very different rates. While an Intelligent Nest is not one that rushes development or makes a race out of hitting milestones, it is a home that provides stimulation, when reasonable, simply for the sake of stimulation. Children love a good challenge and like to ponder our amazing world, just as adults enjoy a Sudoku puzzle. Parents also benefit when children are engaged in learning and so this suggestion is a win-win and requires very little effort and money. Now, you can put on a researcher coat and start pouring glasses of milk for your child or you can give them natural opportunities to wrestle with the theory of conservation. An Intelligent Nest strives to use natural learning opportunities as opposed to adult-centered lessons or lectures as children learn best through their own stimulation and experiences. Toy storage, display and clean-up is perfect for working in natural exposure to the use of space, number, weight, volume, density, etc… Take each toy or set of toys that comes in many parts and store them in a different container. Use a variety of different types, paper, plastic, tin, opaque, translucent, tall, short, long, etc… It is even fun to put too many toys into a container and try to have your children place all the toys back in once they are dumped out. What a great (and cheap!) puzzle. 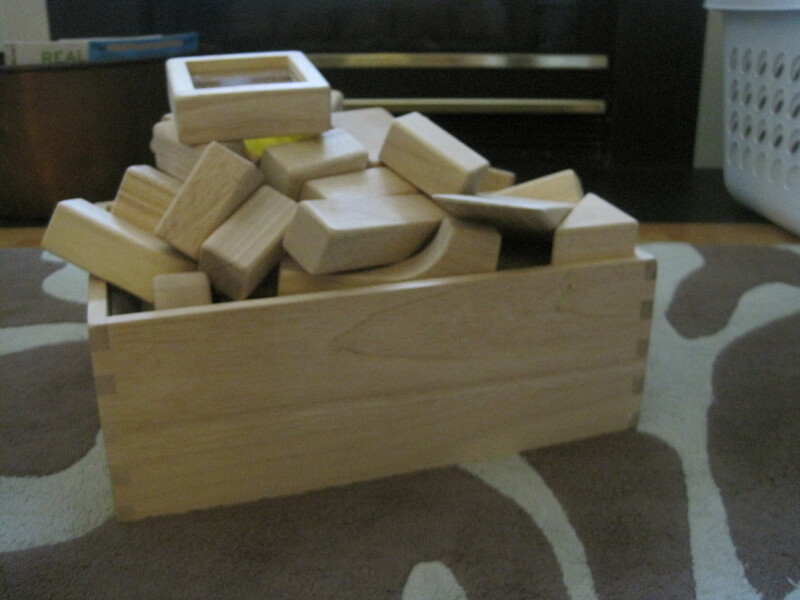 Children will see their blocks a different way every time you change their storage container. One week put them in their wooden container purchased with the blocks, the next week use a paper bag from the supermarket (talk about recycling! ), the next week use a cardboard box that comes in the mail, cut a few holes in the sides for blocks to fit through, make it shorter, etc… and then the next week dump them into a big tupperware. Shoe boxes are some of the best containers for toys. Unlike their plastic tupperware counterparts, they never crack and leave sharp ridges that could harm little bodies. They may get crushed eventually, but then you just through them out- no loss of money and no harm done. I like using dollar stores to find odd containers of different shapes, sizes and colors. I usually buy containers without a designated purpose. If I see a set of toys that isn’t being played with one week (even though I know this toy is still really interesting and age appropriate), I dump the toys into a new container. The different container is usually the element of enticement that draws the child in and invites him to try the toy out in a new way. Now, let’s jump back to the marketing skills that professionals use to design stores and displays. When you walk through Bed, Bath & Beyond can you touch and test items that interest you? Are items placed accessibly so that you can see and reach them? Are interesting products that you would normally not buy placed in areas that catch your eyes? Are you exposed to a plethora of products simply because everywhere you walk products are available for you to examine? Yes, yes and yes! Let’s apply Bed, Bath and Beyond’s product display strategies to organizing toys at home using containers. We know that we need to use a variety of containers instead of a uniform set of tupperware, but where do we place these containers? 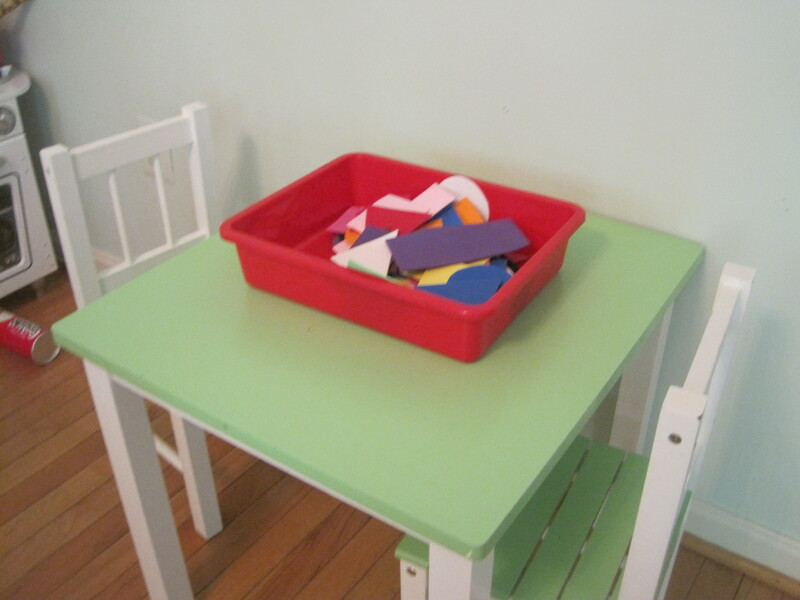 If you have a playroom, I suggest choosing a couple of places that you can always offer a container with toys inside. Then you can strive to rotate the toys and containers every week (or whenever you can, no guilt on The Intelligent Nest). I always keep a bin on my child-sized table with a interesting set of toys and place a couple new containers out each week on our play-area rug. Where would work best for you? Beyond the most obvious places, scatter containers throughout the house in places that your children like to play or places that you need them to play (like the bathroom, so you can attend to your needs). The kitchen is also a great place to keep a container with toys. If you live in a small space and do not have a playroom, then I suggest placing and rotating bins in each kid-friendly room of your home (even the guest room if appropriate) as often as you see fit. Toys develop new purposes and functions given their environment. For example, Mr. Potato Head in the kitchen will be played with in different way than Mr. Potato Head in the bedroom. Place your containers at child-eye-level or on the floor where children can easily reach them. Keep in mind that tall containers where toys stack on each other will mask and hid away pieces of toys and will demand the child to dump the pieces out. Shallow bins are best as they display all the parts more readily. I like to sit on the floor and look at my toy displays before I assume that I choose the best display space. Some container’s walls are so high that a child can barely see over the top when placed on a shelf and that will deter children from looking inside and ultimately playing. Definitely motivated to organize my play room. I need to start looking for new containers as my 3 year old is now playing with toys with smaller pieces they are easier to lose.